Welcome to Part 9. For a series that should be pretty easy to put together, it sure does take a while for me to get them out the digital door. I’m lucky enough to have autographs for several of the 2016 Cubs players at this point, so I have to show them off. Today’s example is a very nice on-card autograph from a high-end set. It’s the kind of card that, unfortunately, many would hate to pull from a box of Museum Collection but I’m happy to add to my hit box. Even after having a hand in the case-breaking world, Autographed cards still fascinate me. Allow me to explain with this series introduction from the early days of the blog. To see the other parts of the series, click on the “Card-ography” tag at the bottom. Now that I’m back into collecting, one of the biggest surprises greeting me at the door was that signatures on cardboard (or on stickers placed on cardboard) are now a regular part of the hobby. In fact, it’s basically expected at this point. I know there are plenty of people who feel that if their box doesn’t have an auto – or even the RIGHT auto – then it’s a waste of money. Hell, I’m still not completely jaded by relics, so I can’t understand this theory. I know that most of the autos aren’t all that valuable, but seeing that blue, red, and sometimes black ink on a card in your hands still holds significance to me. It still makes for some of the most enjoyable moments in collecting. That’s why I’m starting a series that will analyze the signatures we see. It’s common to see people lump them into “good” and “bad” categories, but I want to take it farther than that. This player took the time to sign your card (although some of them don’t take tons of time). I’m going to take the time to inspect it. This card was purchased at the National. I tried to focus some attention at getting cheap hits while I was there, and did pretty well in that quest. 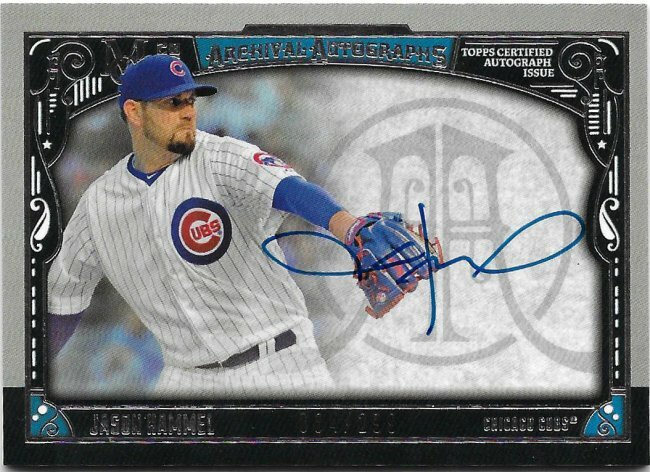 Jason Hammel only had one card with a print run over 50 in that Museum Collection and you’re looking at it. That first section was tough to write. Honestly, it looks like a flying stick more than anything. I have no idea where his name fits into this signature, but it’s cool looking. Jason does take advantage of the space given to him and isn’t afraid to bleed into the picture a bit as needed. There isn’t any from my perspective. It looks like he’s adapted his signature to be quick and easy, but consistent and dynamic. What’s interesting is that I have proof that his signature has changed. I have an older auto from his rookie year that shows more letters and gives a better sense of his name, but I like this simplified way more. Jason hasn’t signed a lot since that 2005 rookie year, and didn’t get many cards after that, either. So it’s awesome to have an on-card auto with the Cubs uniform on. I have several more to chase from his Chicago tenure, and it’s great that they can be found on a low budget for a neat looking signature like his. This would make an excellent mystery autograph, because I can’t see Jason Hammel anywhere in the signature. But you’re right… it’s very cool looking.